Forget your complexion troubles and get happy! 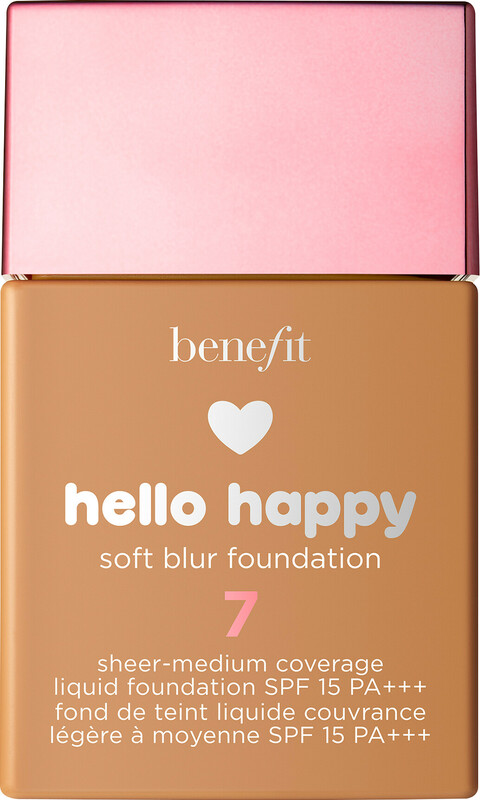 Say hello to glowing skin with the Benefit Hello Happy Soft Blur Foundation SPF15, a light-to-medium coverage base for all skin types. The ideal foundation match for those who want their skin to look irresistibly fresh, Hello Happy makes the most of your natural beauty while blurring away imperfections. Its weightless formula looks like skin and feels like nothing at all! To even out your skin tone and add natural-looking radiance, Hello Happy uses clever soft-focus optical spheres that help you disguise the bits you’d rather hide. 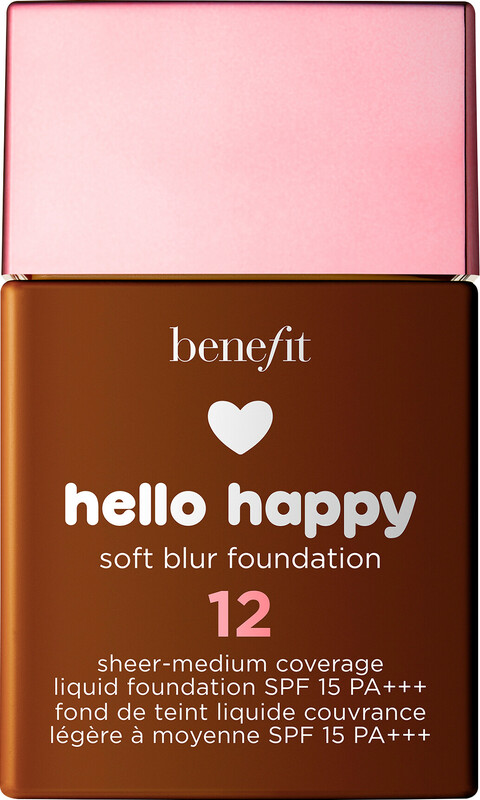 Its fluid, comfortable and versatile finish makes it the perfect everyday foundation, available in 12 inclusive shades from the fairest to the deepest. Shake the bottle well before use, then blend one drop onto clean and moisturised skin. Repeat until you reach your desired level of coverage. AQUA (WATER), PHENYL TRIMETHICONE, ALCOHOL DENAT., DIMETHICONE, ISODODECANE, ETHYLHEXYL METHOXYCINNAMATE, SILICA, BUTYLENE GLYCOL, PEG-10 DIMETHICONE, TITANIUM DIOXIDE, METHYL METHACRYLATE CROSSPOLYMER, POLYMETHYLSILSESQUIOXANE, MICA, SODIUM CHLORIDE, DIMETHICONE/PEG-10/15 CROSSPOLYMER, ISOHEXADECANE, SQUALANE, POTASSIUM SORBATE, SODIUM DEHYDROACETATE, DISODIUM STEAROYL GLUTAMATE, TOCOPHERYL ACETATE, ISOPROPYL TITANIUM TRIISOSTEARATE, ALUMINUM HYDROXIDE, DIPROPYLENE GLYCOL, BUTYROSPERMUM PARKII (SHEA) SEEDCAKE EXTRACT, SODIUM CITRATE, TOCOPHEROL. [+/-: CI 77163 (BISMUTH OXYCHLORIDE), CI 77491, CI 77492, CI 77499 (IRON OXIDES), CI 77891 (TITANIUM DIOXIDE)]. N°12835/A.